I read this article and found it very interesting, thought it might be something for you. 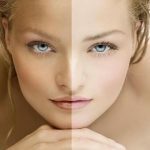 The article is called Face Mask to Give You a Natural Tan with Carrots and is located at https://homemademasks.net/beauty-blog/face-mask-to-give-you-a-natural-tan-with-carrots/. A simple home made face mask can be a great solution if you want a tanned complexion in a natural way. How can carrots help you tan? Well due to carrots content of beta-carotene (a Provitamin A) the activity of melanin in the skin is stimulated and so you can actually get your skin tanned in a natural way. Beta carotene is highly used in many products for tanning due to its rapid skin coloring effect. The Provitamin A contained by carrots does not only help with the tanning process of your skin but it also protects you from the negative action of ultraviolet radiation. Therefore the beta carotene from fruits and vegetables (spinach, carrots, tomatoes, cherry, pumpkin, watermelon) stimulates the production of melanin, the pigment that is responsible with skin darkening. Carrots contain large amounts of vitamin A and can definitely help keep your skin beautiful and healthy. They can be also the ideal solution if you are dealing with dry skin. Moreover, they also contain antioxidants which help protect and moisturize any type of skin while keeping it safe from the negative action of the sun. So if you just had a long exposure to the sun, just apply some grated carrot on the affected area. A carrot treatment can help wounds heal faster. Peel two medium carrots and boil them until they become soft. Mash the carrots with a blender until they become a paste. Add the honey, olive oil and squeeze the juice from a quarter mixing everything really well. Add also a bit of mineral water if you think the mask need to maintain its consistency though if you feel you no longer need the extra liquid, you can skip this step. Leave your mask to cool for 10-15 before applying it on the face. Wash your face with warm water and dry it with a clean towel. Apply the mask on your face and neck and leave it on for 15 minutes.